Dubai. Just a mention of this name is enough to conjure up images of a city that, despite being a desert, has the best of everything that money can buy; Luxury, opulence, skyscrapers, shopping malls, 7 star hotels, exotically shaped islands and much more. Dubai has all of this but also has a historical and unique cultural side which forms the soul of this futuristic metropolis. 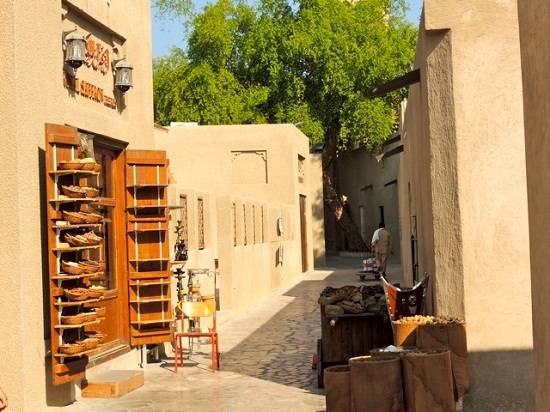 The Bastakiya quarter is one of the oldest traditional Emirati neighbourhoods and a must-visit in Bur Dubai. Dating back to the early 1890s these were the original houses along the Dubai Creek that belonged mainly to wealthy pearl and textile traders. This quarter still retains an old world look and charm and you can walk along the narrow lanes and explore the traditional houses that are a maximum of two stories high. They have large, central courtyards and rooms surrounding it with traditional wind towers (for cooling in the hot climate). The doors here are all wooden with intricate carvings and elaborate arches. Today this area is also the arty side of the city with narrow galleries, trees and flowers in contrasting colors, numerous small museums, art galleries, heritage houses, souvenir shops, spice stores and quaint cafes with local delicacies. The Dubai Museum is housed in the Al Fahidi Fort, which was built in 1787 and is the oldest existing building in Dubai. Though it is a very small museum, a trip to this place is highly recommended as it gives you an introduction to Dubai’s journey from a small fishing and pearl trading town to the heights that it at today. This museum also provides an insight into the old Dubai culture, tradition, history and a glimpse into the life of the olden days. While walking in Bur Dubai and Diera you come across many souqs selling textiles, spices and gold. Historically souqs were open air market places or bazaars where travelling merchants would display their wares for sale. Though there are no travelling merchants today, the souqs and the wares still remain here. Walking along the promenade in Bur Dubai you will see the textile souks selling all kinds of fabric in cotton, silks and for all purposes and occasions. If you want to shop though, be prepared to bargain. You can then take a local abra or water taxi and cross the Dubai creek to visit the spice and gold souks. 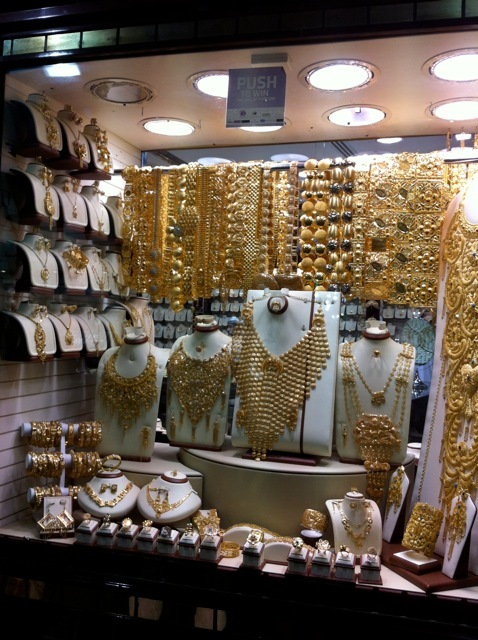 The Deira Gold Souk is a must visit even if you don’t intend to empty your pockets on gold. It has more than 300 retailers and is a long lane with shimmering and glittering gold hanging out in the shop windows as long as your eyes can see. It’s quite a sight. Adjacent to the gold souk is the spice souk which sells an immense variety of all kinds of local spices, teas, sheeshas and local fragrances. This is an old traditional house that was built around 1890 for a wealthy Iranian merchant. This is now open to tourists and you can see the insides of a typical house, the courtyards, rooms, cooling towers and various small movies introducing you to the life in the olden days. You can then see the Al Ahmadiya School which was built in 1800s and taught around 800 students in 21 classes. Though this school no longer exists, you can still visit the classrooms and get a glimpse into the lives of the then students and teachers through pictures and other aids. 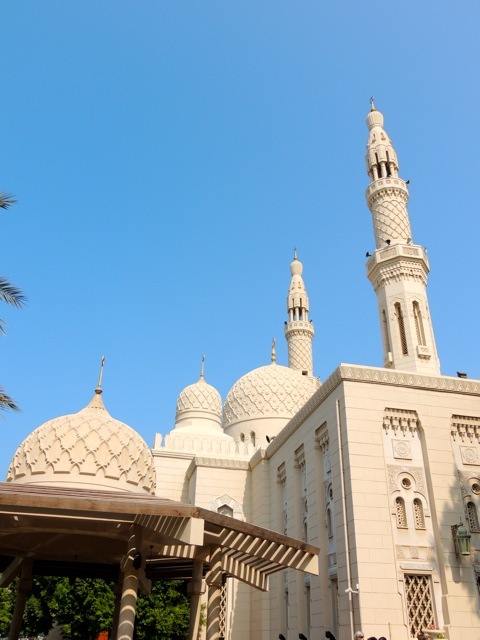 The Jumeirah mosque is the only mosque in the UAE that is open to the general public and women. The Sheikh Mohammed Centre for Cultural Understanding (SMCCU) started these tourist visits to raise awareness about the local culture, customs and religion of the UAE, and to thereby increase cross-cultural dialogue with guests. During this visit a local volunteer takes you around the different parts of the mosque, explains the customs and rituals and then answers all your queries on Islam. The desert safari is a quick and easy way to experience a traditional Bedouin lifestyle in the deserts along with the adventurous “dune bashing”. A typical desert safari takes one day and includes a pick and drop from Dubai, fun-filled dune bashing, camel riding, belly dance performances in a desert camp, sheesha-smoking, arabic coffee and traditional dinner. If you want to spend the night under star filled skies then there are options to stay in a tent in one of the desert camps. Depending upon the area you are in you can visit any local traditional restaurant or be a part of SMCCU’s Cultural Meals activity that includes a traditional Emirati breakfast or lunch in a Bastakiya house along with an Emirati host and discuss all about the UAE culture, customs and religion. Snigdha is a traveler, travel blogger and an amateur photographer based out of Mumbai, India. You can read more on her and her wanderings at Get Set and Go , follow her on Twitter at traveler_buget or on Facebook. If you'd like to see the cultural and historical side to Dubai then take a look at our cheap flights to Dubai from just £319. We also have 3-night holidays to Dubai from £375 including flights and accommodation.